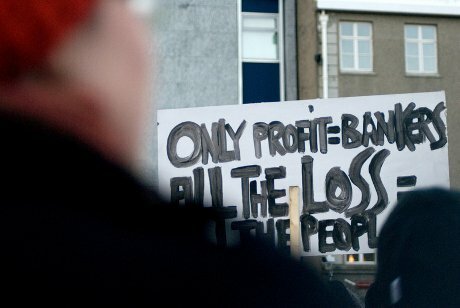 Protestors outside the Icelandic Parliament, 2010. Demotix/Cinzia d'Ambrosi. All rights reserved. The Icelandic constitutional experiment attempted to bring more equality and direct democracy into Icelandic society. Yet, the parliament has been reluctant to respond. Now, after almost two years of fruitless debates, the coming national elections cast a negative shadow over the future of the new constitution. In the fall of 2008 the Icelandic financial system collapsed following the bankruptcy of the major Icelandic banks. After people stood up for themselves in a series of vociferous demonstrations, the right-wing Prime Minister resigned and a new left-wing coalition, comprised of the Social Democratic Alliance and the Left-Green Movement won the national elections. But quickly, general disillusion towards traditional politics provoked grassroots political initiatives. Among them, a new draft constitution was written by an elected Constitutional Council of 25 ordinary citizens using the internet to gather input from citizens. In 2011 the bill was presented before Althingi, the parliament of Iceland, which started discussions preceding the vote. The government soon realised that the hostility of the opposition parties could prevent the bill from being approved. It then called for a national referendum, held in October 2012, to show that the constitution was backed by the whole nation. Though the referendum was non-binding, general belief was that if the outcome was positive, the parliament would feel under far greater pressure to proceed accordingly. With a 49 percent turnout, two thirds of the voters affirmed their wish for the proposal of the Constitutional Council to be used as the basis of a legislative bill for a new Constitution. But contrary to initial expectations, the parliament then proceeded to disregard the popular will and has yet to agree on the draft. It is not that MPs were completely blind to what was happening outside the corridors of power - the issue has actually been debated extensively in parliament… So extensively, indeed, that they were not able to put it to a vote before the end of the current parliamentary session and elections, which are due on 27 April. The problem is that the newly-elected parliament will then have to start from scratch. “I’m disappointed, but I’m not surprised,” says Gudrún Pétursdóttir, chairman of a Committee that helped the Council draft the constitution proposal. The conservative opposition, made up of the Independence Party and the Progressive Party, has never looked kindly upon the work of the constitutional council. However, the ruling coalition of the Social Democratic Alliance and Left-Green Movement, which formerly backed the work of the Constitutional Council, have also failed to show unanimous support for the draft. One of the most disputed clauses in the constitutional draft is the one stating that Iceland's natural resources are the “perpetual property of the nation.” It is no surprise that the Independence Party strongly opposed it, as the fishing industry, a traditional supporter of the conservative party, would be most damaged by this clause. The stalled situation, according to 'The Movement' MP Margrét Tryggvadóttir, happened because the draft introduces changes on how politicians should behave. “But they clearly want the old ways,” she says. The future of the constitution now depends on the election results. As many as 15 parties have submitted their lists of candidates. This exceptionally high number seems to reflect people’s disillusionment with old politics. Tryggvadóttir, who is now a candidate for the newly formed Dawn (Dögun) party list, explains: “four years ago everyone was angry and hopeless, but now people feel they can make some changes.” Only a few parties, however, are expected to reach the five per cent threshold necessary to earn seats in Althingi. Perhaps surprisingly, given the popular wish for political renewal, the long-established Progressive and Independence Party are currently leading the polls. A survey conducted this week by the Social Science Research Institute for the newspaper Morgunbladid reveals that respectively 24.4% and 24.8% of voters favour them. Back in 2008, they were blamed for the financial collapse, but a restyling of leadership faces has enabled them to come back into play again. These are also the parties that have objected most to the work of the Constitutional Council. However, as Tryggvadóttir asserts, “that doesn’t mean that Icelanders don’t want a new constitution,” but just that “people are struggling with loans” and see in the programme of the Progressive Party a solution to their problems. As home debts are connected with inflation, and inflation is very high, sorting this out is now a priority for Icelanders. By making good use of the citizens’ disappointment with the government, Pétursdóttir affirms, “they’re making populist promises that are impossible to keep.” “That’s why they’re doing so well,” she concludes. Regardless of the majority Althingi will have next week, parties such as Píratar and Dögun are ready to fight to see the draft constitution approved. “If we don’t manage to replace the whole constitution, we’ll work to implement at least the clauses that went before the referendum – and that people clearly wanted,” states Gunnarsson. “To do so, however, we need to deal with every single point individually and that’s going to be a long process,” he concludes. To become law, the new constitution – or the amendments to the old one – has to be put through a parliamentary vote. Once it has been approved by two thirds of the 63 MPs, new elections are to be called and the newly-elected Althingi has to ratify it again with at least two thirds of votes. The council has submitted a proposal, and the nation has expressed itself through a referendum. It is now up to the Icelandic parliament to take this process seriously. It will certainly take years, but now that citizens know what they themselves are able to do, they will not be content to just stand by and watch.